All EIB projects must support at least one of the Bank’s four public policy goals (defined in the Bank’s Corporate Operational Plan): innovation and skills, SME and mid-cap finance, infrastructure, and environment. The Bank also has two cross-cutting policy objectives which cover all sectors and activities: cohesion, which addresses economic and social disparities across the EU, and climate action, covering climate change mitigation and adaptation. In 2017, the EIB signed loan contracts worth EUR 54 billion for 380 new operations inside the EU in support of projects with a total project investment cost of EUR 207 billion. This report focuses exclusively on the potential impact of the new operations signed in 2017. New operations are operations for which the first tranche was signed in 2017. While several signatures may be associated with any given project, the analysis presented here takes into account only first signatures. Promoting and supporting the development of innovation and skills is essential for the development of the EU’s knowledge economy and the achievement of Europe 2020 targets. 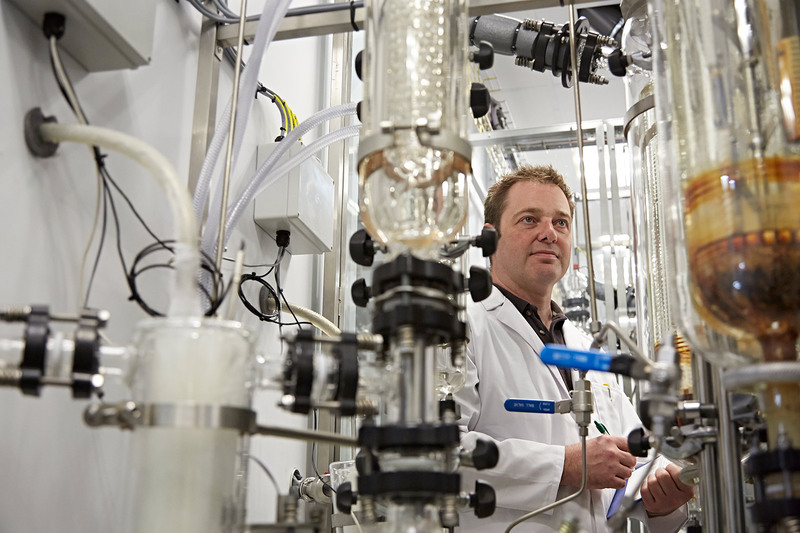 EUR 12.1 billion of new operations supporting innovation. More than 90 private sector companies were granted loans in support of R&D projects. The EIB’s continued investment in ICT and broadband networks facilitated access to high-speed data services for an additional 7.4 million households. Over 1.1 million students benefited directly from EIB-supported projects. A substantial number of the projects supporting innovation also supported either or both of the Bank’s cross-cutting objectives: a research, development and innovation (RDI) project in a convergence region will also promote cohesion, and a schools project in France with a substantial energy-saving component also contributes to climate action. Small- and medium-sized enterprises (SMEs) and mid-caps employ around two-thirds of the working population of the EU, and represent over 90% of all EU corporates. Although they play a critical role in the European economy by creating jobs, developing wealth and promoting innovation, they often have limited access to external financing. This is why access to finance for SMEs and mid-caps is a key priority for the EIB. 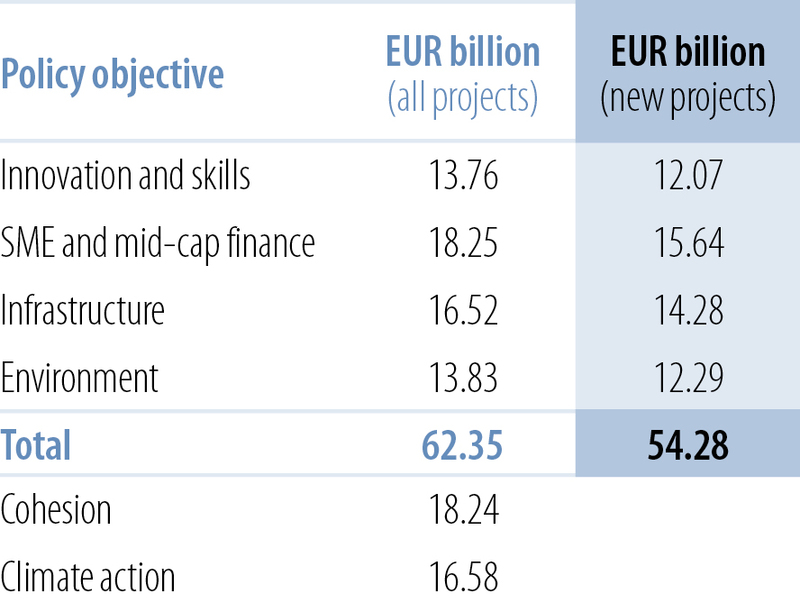 EUR 15.6 billion of new operations for SMEs and mid-caps. InnovFin bridges the gap between demonstration and commercialisation stages in venture company growth. Internal markets and economies depend on modern infrastructure. EIB finance helps to ensure that the EU has the sustainable, efficient and well-integrated infrastructure it needs to create a ‘Smart Europe’. EUR 14.3 billion of new infrastructure operations. EIB infrastructure finance supported the development of strategic transport (including Trans-European Transport Networks ̶ TEN-T), energy infrastructure (including Trans-European Energy Networks – TEN-E) and numerous projects to promote integrated territorial development. Over 1 100 lane-kilometres of roads and highways are to be upgraded or built. Over 1 200 km of railway track and more than 16 stations are to be upgraded or built, to support some six million additional passenger trips. Additional airport capacity to be created to accommodate over 40 million additional passenger trips per year. Improvements to ports will provide over 3 million additional tonnes of annual port cargo capacity. The Bank’s infrastructure investments often support cohesion and climate action objectives as well. Improved rail services to persuade people not to use their private cars, or low carbon and climate-resilient urban development are examples of infrastructure projects which contribute to the cross-cutting objective of climate action. The EIB is committed to an EU environment lending portfolio supporting a healthy and safe environment for both people and nature. To achieve this, the Bank invests in projects which promote clean air, biodiversity, sustainable transport, natural resource efficiency and the circular economy, renewable energy and energy efficiency. EUR 12.3 billion of new environmental operations. Some 21 million people are expected to benefit from safe drinking water. 37 million people are to be served by treatment facilities and 1.8 million persons will benefit from new waste collection systems with recyclables/bio-waste collected separately. Over 1.6 million people are expected to face a reduced risk of flooding. Some 5.3 million households could be supplied with the energy generated from renewable energy sources. Many of these projects also support climate action, for example through lower carbon transport solutions, energy savings and afforestation. By the end of 2017, the EIB approved 358 projects for EUR 39.2 billion, of which 278 projects were signed for EUR 27.4 billion of EFSI-backed financing under the Infrastructure and Innovation Window (IIW). The total approved number of operations including cancelled operations was 362 for EUR 39.3 billion. EUR 131.1 billion of eligible investment mobilised. Eligible investment mobilised: eligible part of the overall Project Investment Cost. Almost 15 million additional households are expected to have very high-speed broadband access. An extra 240 000 tonnes of waste treatment capacity will come on stream. 1 500 rolling stock units will be acquired and over 75 km of rail tracks upgraded. Over 110 private sector companies received financing for RDI projects, with a potential of more than EUR 80 billion of additional sales. Nearly 9 000 new 4G transmission sites are to be installed. Over 1 300 lane-kilometres of roads and highways will be upgraded. 6 million tonnes of new cargo handling capacity in ports will became available. 13 000 MW of additional electricity generation capacity is to be built, of which 95% from renewable energy sources, and over 8 million households will be supplied by the energy generated. Over 264 000 km of water mains and distribution pipework will be installed or upgraded, with over 17 million people benefiting from safer drinking water. Although the Bank’s remit is economic development, rather than job creation, the projects it finances lead to increased employment during both implementation and operation. The financing which the Bank provides to support education, training, research, development, innovation and early-stage company growth should also have direct employment benefits. The Bank’s investments contribute to the development of new technologies, the creation of innovative products, and the introduction of new, collaborative ways of working. Furthermore, they help to create the conditions necessary for wealth creation and sustainable economic growth, opening the way to a sustainable future for Europe.